One of the best ideas to ever be adopted by Mcfarlane Toys was simple in concept, but perfect in execution. It was the Movie Maniacs, a line intended to cover all those movies that had truly memorable single characters, but not enough to carry an entire series. By putting them under one banner, McToys was able to make peg space for characters like Edward Scissorhands and Chucky. However, in recent years, McToys has moved away from the concept, filling the Movie Maniacs line with single licenses like Texas Chainsaw Massacre or Aliens and Predators. The concept is still valid though, and other companies have moved in to fill the void and provide some unique characters that the fans are clamoring for. SOTA is one of those companies, and their line is called Now Playing. 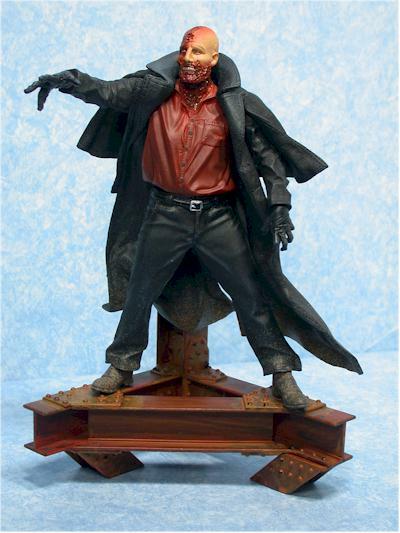 The first series is now hitting retailers and includes Darkman (reviewed tonight), the Nightmare Demon from American Werewolf in London, and the Toxic Avenger. Plans for several more series are already in the works. You can expect to pay around $11 - $12 each for these, and they are hitting comic shops and online stores first. I suspect we'll see them at specialty shops like Media Play and Sam Goody very soon. There's several exclusives in this line along with the three standard versions of the characters. 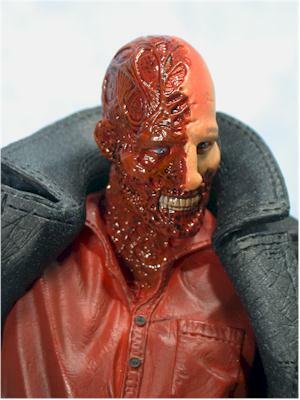 The SOTA Toys web site has an exclusive version of both the Nightmare Demon (with mohawk head) and a translucent version of the Toxic Avenger. The Nightmare Demon also comes in four different versions. Each comes with one same, standard head, and a second alternate head that's different. One is a wolf's head, and one is a helmeted head. Each of these can come with either a gun or a knife, making four different versions. 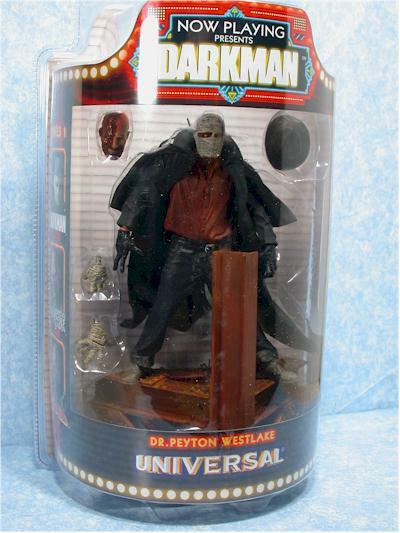 Finally, Tower Records will have an exclusive version of Darkman that includes a partially bandaged second head. SOTA tries to do unique things with their packages. Unfortunately so far, it hasn't worked. This time around, the packages look like a convex movie marquee. The package is massive though, and while it will hold up to shelf wear just fine, will be a bear for any MOCer to store. These are some of the largest, and wasteful, packages I've seen in ages. That's the one and only real issue with this line. Dr. Petyon Westlake looks excellent, in all his various head sculpts. 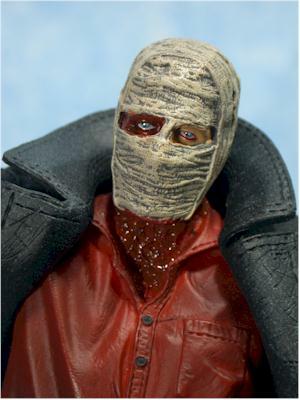 The standard figure has two heads - one bandaged fully, and one showing all his horribly disfiguring burns. Even with the damage to his face though, you can still see Liam Neeson. Now, when you shoot close up photos, you'll notice that the bandages seem a little odd. They do look a bit plasticy, and soft, not like realistic bandages. However, when you aren't shooting up close, they look extremely realistic. The scarred flesh looks perfect up close or not, sort of like a gruesome version of Gray's Anatomy. Along with the two heads, there are two sets of hands, a bandages set to match the bandaged head, and a gloved set to use with either head. The sculpting here is excellent as well. The body sculpt is solid, with a nice mixture of textures to imply different materials and fabrics. The coat is given a dynamic, flowing appearance, without being over done or excessive. The scale on these figures is 7", and Peyton fits in fairly well with recent figures from competitors. I have included a shot of Dr. Westlake with the recent Michael Myers from NECA, and the recent Robocop from Mcfarlane. The paint ops are solid all around, using various finishes to indicate different materials, and generally giving the figure a realistic and exciting appearance. The bandages are the one area that there is a little trouble again, and it's really a combination of the paint and sculpt that make them appear less than life-like on close inspection. However, since your eyeballs can't see the face nearly as well as the zoom on my camera, it's not likely that it will be a big issue for you. Small detail work is done particularly well, and you'll probably be happy to note that there's no excessive washes - except on those bandages. There is a nice splattering of mud on the shoes, lower pant legs, and back of the jacket, that looks more realistic than this type of paint app normally does. 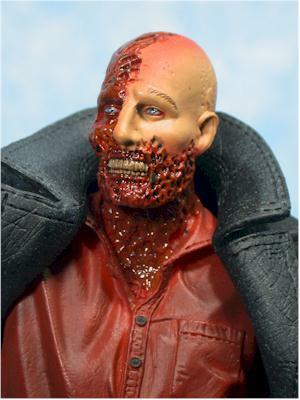 My favorite aspect of the paint work though is the glossy finish on the exposed flesh of his face and neck. It gives it a wet, oozing appearance that contrasts perfectly with the matte finish on the skin and clothes. These aren't highly articulated figures, yet they aren't straight statues either. 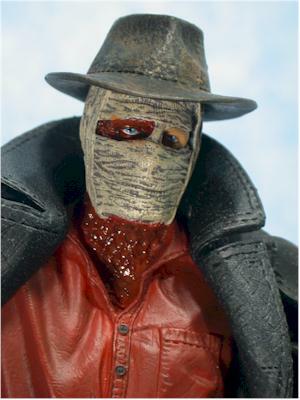 Darkman has the single most important joint for expressing personality - the ball jointed neck. The heads pop on and off extremely well too, and I was surprised how well they worked. The range of motion is also extremely good, and you can use this joint to give him all kinds of expressions. He also has ball jointed shoulders, cut elbows, wrists, waist and ankles. 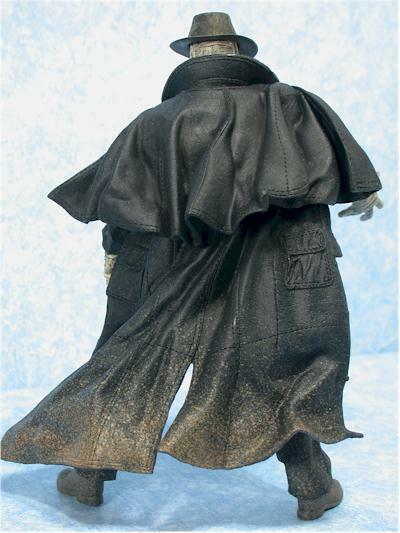 The arm articulation allows for some posing, but the coat tends to restrict your options. I've mentioned the two heads and two sets of hands, all of which look great and pop on and off easily. The ball jointed neck works particularly well, and I was shocked at how easy it was to swap heads, yet the joints were tight. 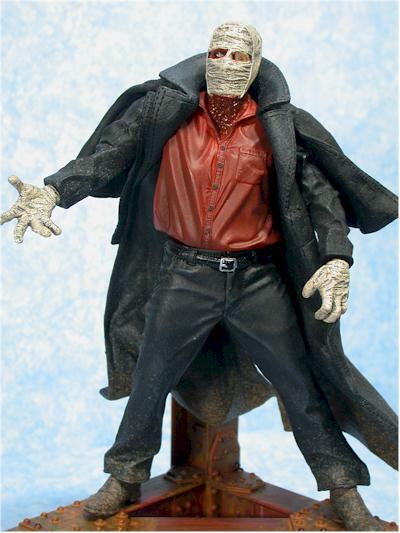 Along with the extra head and hands, Darkman also has a girder display stand. 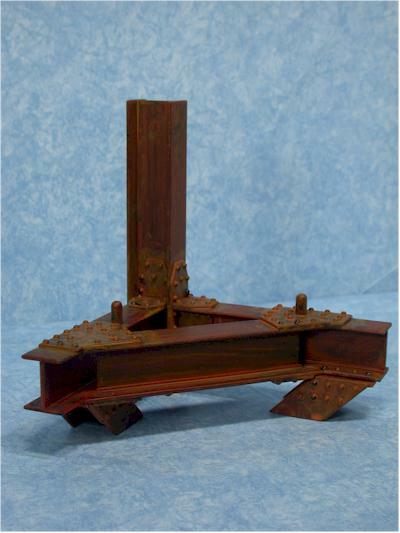 It's extremely appropriate to the figure, has posts for both feet, and is very sturdy. I really like how the bottom has additional girders, rather than simply being flat, giving the impression of depth. Dr. Peyton also has his hat, which fits on top of either head. Unfortunately, it doesn't fit perfectly on either one, and I found myself picking it up off the floor far more than I like. Still, it looks good when you can get it to stay put, and would also work well for an Indy custom. Kids are unlikely to find this figure particularly interesting, unless they are into B movies of the 80's and 90's. Unless you're a big fan of the film, this figure isn't going to be a lot of fun. Even if you are, I don't expect you'll be battling it out between he and Michael Myers on your desk. The market standard right now for this type of figure is between $10 and $15. For a smaller company like SOTA to be able to get these in at $11 at some retailers is very good, especially with the extra heads as accessories. This is a great first effort in this new line, and bodes well for series 2 and 3. I also have the Nightmare Demons, and love their appearance as well, but I'm hanging on to them for a future review in case this current toy drought continues for the next week or two. I didn't buy the Toxic Avenger though, but not because he was poorly done, but because I have zero interest in the character. 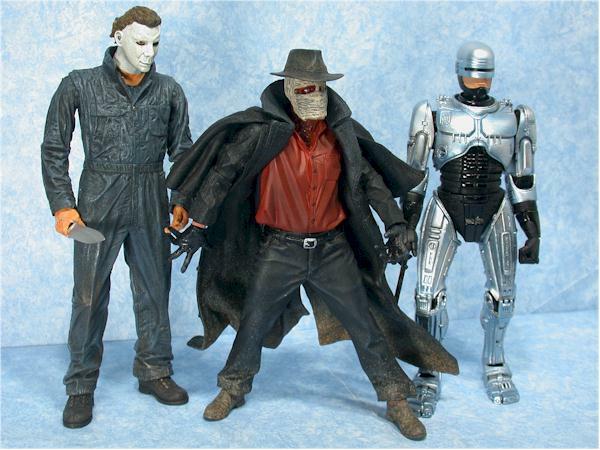 These will fit in pretty well with your other Movie Maniacs, and hopefully with the Coming Soon figures from NECA. While the companies may all be battling it out death cage style for licenses and dollars, the fans are really winning here with the chance to have a great looking display of a ton of lesser known movie characters. - I picked up mine through OMGCNFO.com, and I have to give them some serious props. They got them in on Monday, I ordered that afternoon, and my figures were on the door step Wednesday. That's a great turnaround! They are just $11 each as well. - You can pick them up directly from SOTA's site for $13 each. - CornerStoreComics has series 1 for $12 each, or a set of three for $35. They also have pre-orders up for all of series 2 and 3. - Killer Toys has the set for $32, or the singles for $12 - $15. They also have preorders up for future waves.